Animated GIFs uploaded this WordPress should be no wider than 900 pixels. Preferably, they should be 600 pixels wide and under 5MB in file size. 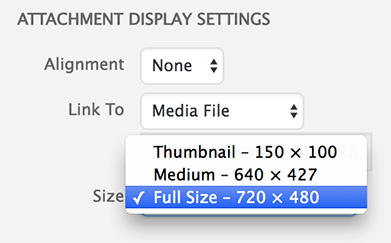 When uploading and embedding animated GIFs in your WordPress posts, it's essential to select "Full Size" in the Attachment Display Settings of the media manager. The reduced size versions are not animated! EzGif.com is an online GIF maker, editor, and compressor. It provides tools for resizing, cropping, watermarking, and optimizing animated GIFs. It can also allow you to trim GIFs temporally (deleting frames), and change their frame rate. It's my preferred tool for reducing the file size of GIFs. Giphy.com provides an easy tool for converting an online video (from YouTube or Vimeo) directly to an animated GIF. Unfortunately, the GIFs it makes have fairly small dimensions; to make a larger GIF, you'd have to download the video file, extract the fragment you wanted, and use other methods to convert the fragment to a GIF. LICEcap is a badly-named free OSX app which can capture an area of your screen and save it directly to an animated GIF. Gifmaker.me is a free online tool which allows you to create animated GIFs from image sequences. This can be handy if you've used code to generate (and save out) a sequence of frames. Online-convert.com offers a browser tool for converting videos into GIFs. There's a similar service available at https://www.onlineconverter.com/video-to-gif, too.